On this Veteran’s Day, take a moment to remember what our servicemen and women fought and still fight for: freedom. The freedom to think for ourselves, the freedom to speak, the freedom to have opposing viewpoints, and the freedom to be informed when we make our decisions. It’s because of these freedoms that we have the ability to make our food choices, as I choose to eat sustainable food, including rabbit. Those of you who are vegans and bunny lovers also have the ability to make your own eating decisions and express why you disagree with mine (which my twitter feed shows). Our differences foster great discourse, and hopefully make the world a better place, as we cannot and should not all have the same thoughts, or we’d be robots. 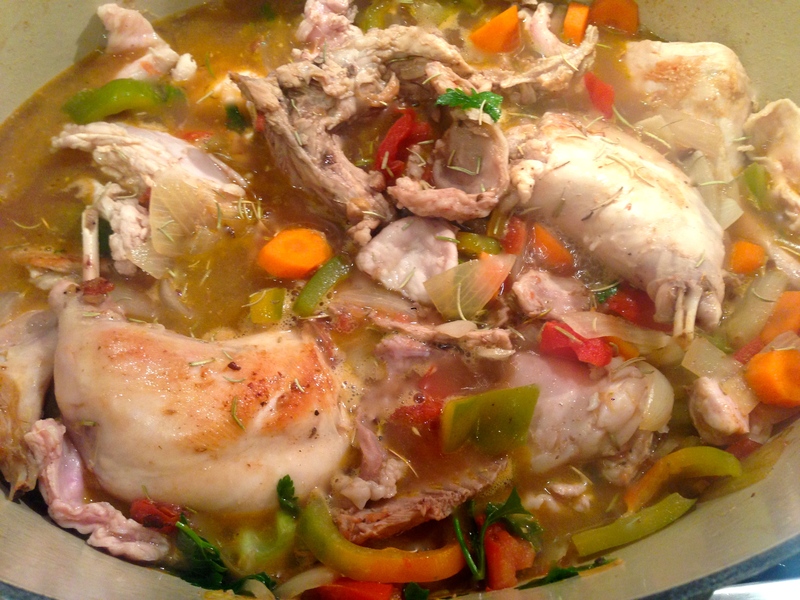 My decision to make rabbit is apparently a popular one, since Whole Foods seems to sell out quickly. At $9.99/lb, it’s a little expensive but cheaper than most red meat. But there’s also a reason to pay a premium. As I learned on the East End, rabbit happens to be lower in fat than chicken and a good option as a sustainable food source. This one was raised without hormones or antibiotics and fed grains and wheat. I took inspiration in this recipe from Coq Au Vin and Beouf Bourguignon and, as always, used ingredients I had on hand. Only two more weeks of my CSA, then I will have to go back to cooking without tomatoes and peppers. 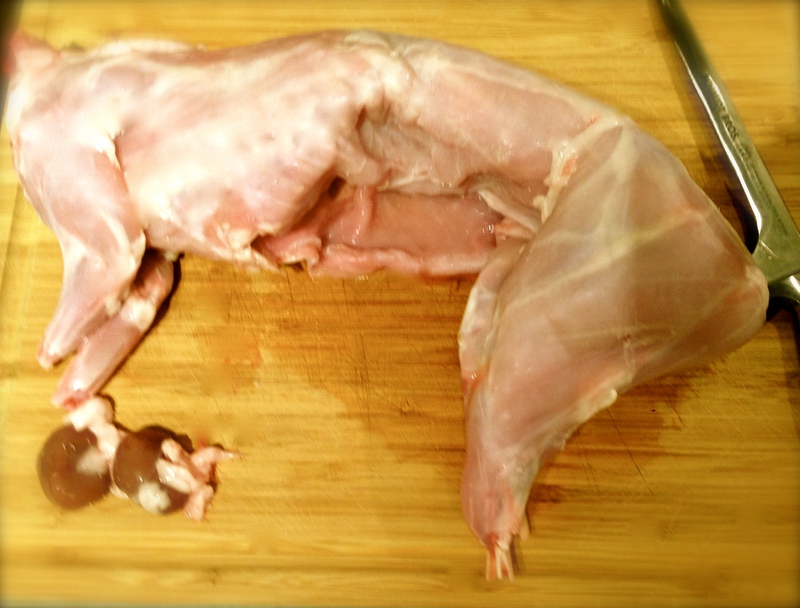 Since this rabbit was whole, my first step was to attempt to butcher it. I did fine with the legs, but the rest was a little less than perfect. I was mostly concerned with not wasting meat, so I did my best to use everything. But I’d recommend asking your butcher to cut it into pieces, if possible. Once the rabbit is butchered, sprinkle it with salt, pepper and thyme. Add pancetta to a Dutch oven with 2 tbsps of butter and cook over medium low for about 5 minutes. Increase the heat to medium high and then add the legs to the pan and cook until browned, flipping as needed to brown evenly, which should take about 10 minutes. Reduce the heat to low and add the rest of the butter. 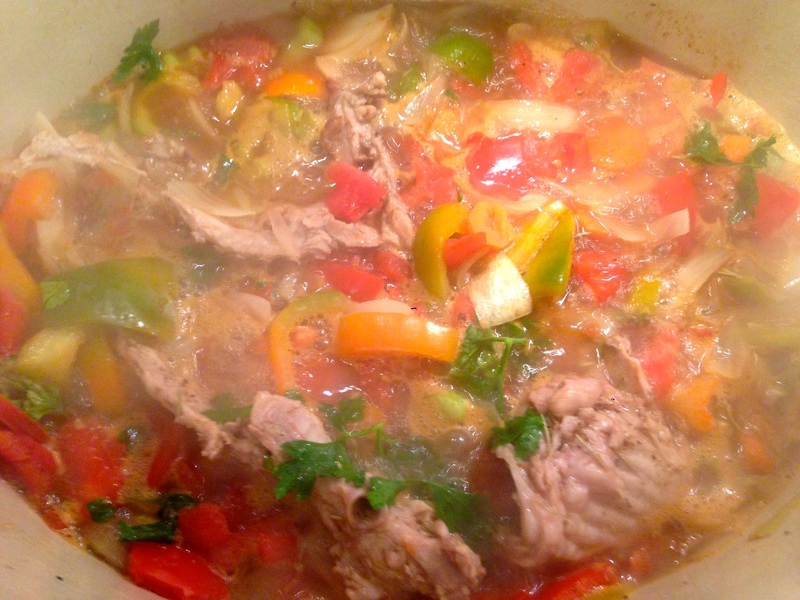 When melted, add the onions, celery, carrots, tomatoes and peppers. Sprinkle with salt, pepper, thyme, rosemary and parsley. (I had dried thyme and rosemary, but fresh parsley. Use fresh for everything if you have it.) Cook for 5 minutes. 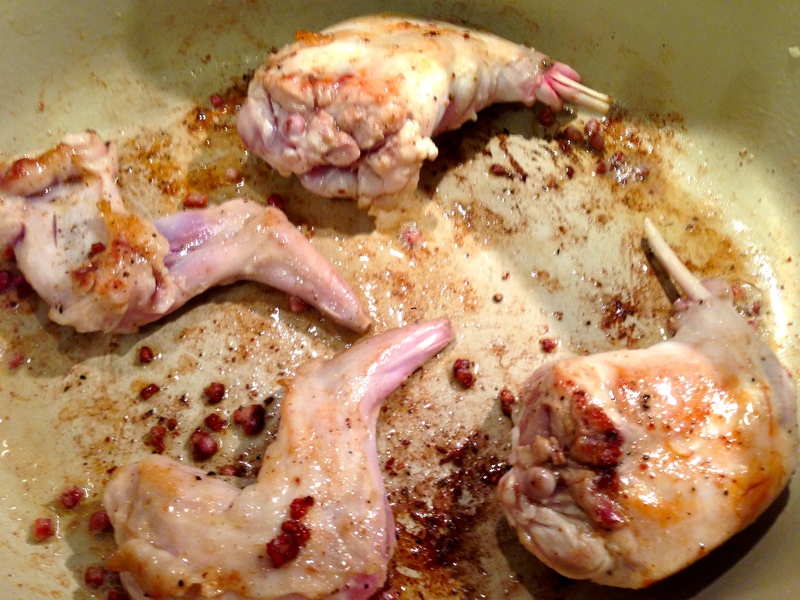 Then if you have rabbit bones (like I did) and any heart or kidneys, add those to the pot for added flavor. Then add the wine. Cook for 3 minutes. Then add the stock. In the meantime, bring a large pot of salted water to a boil. Cook the pappardelle until al dente. Drain and toss with a bit of olive oil, so it doesn’t stick. Remove the rabbit from the pot. 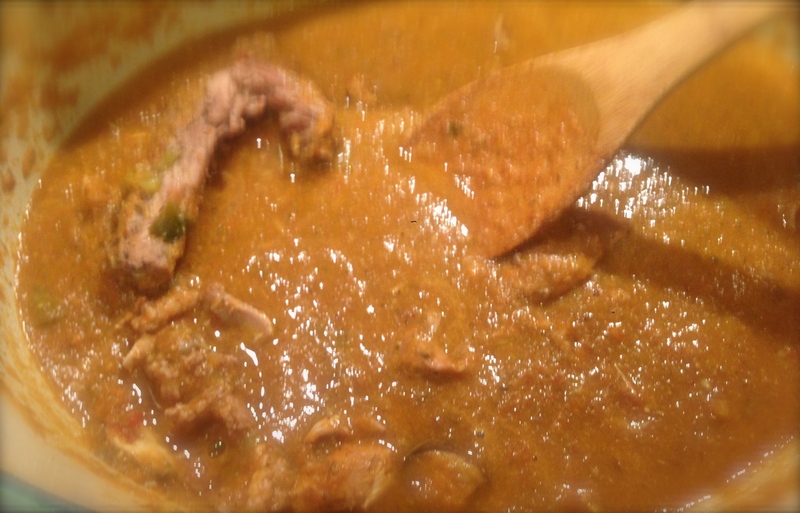 With an immersion blender, puree until it the sauce is thick. Add the rabbit back to the pan and toss to coat. 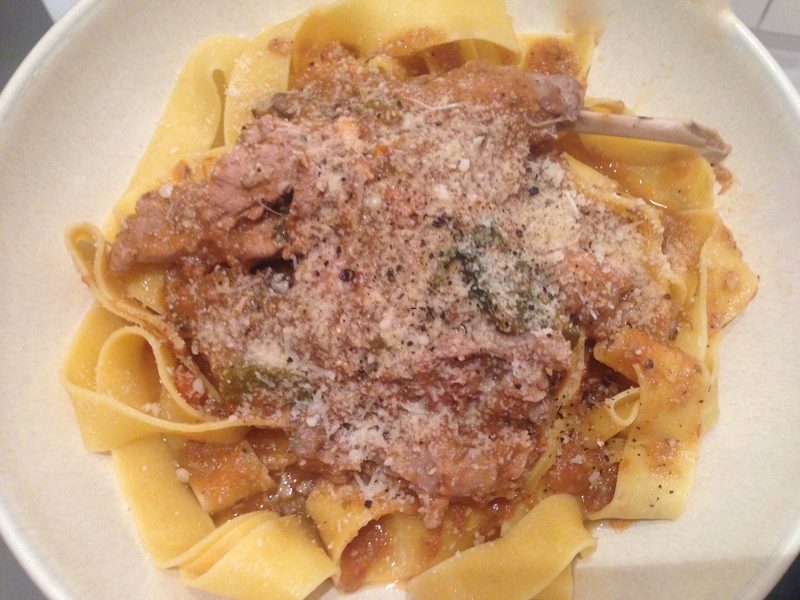 Plate the pasta and top with the rabbit and sauce. Sprinkle with parmigiana, if desired. To drink: as always, the wine you used to cook with is the obvious and best choice. If you want a cocktail, I’m currently loving Old Barrel Vodka, which is finished in cognac cases. It has a slightly sweet flavor that is great if you want to use it for a Negroni or have it with some sweet vermouth and a dash of cherry bitters.